Detach the front part of Mirror Mount. Detach the fixing screw of mirror. *Use flat-bladed screwdriver or somthing equvalent and turn the screw to detach. Referring to the picture, place Reflecting Mirror in the mirror mount. 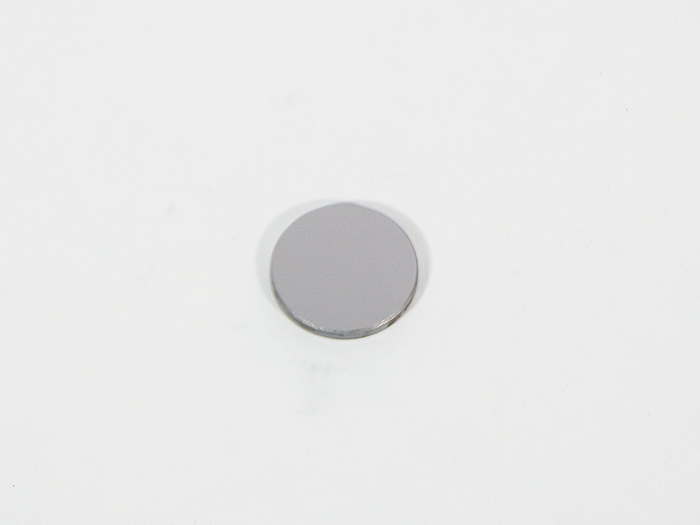 *The picture shows the back side of Reflecting Mirror. 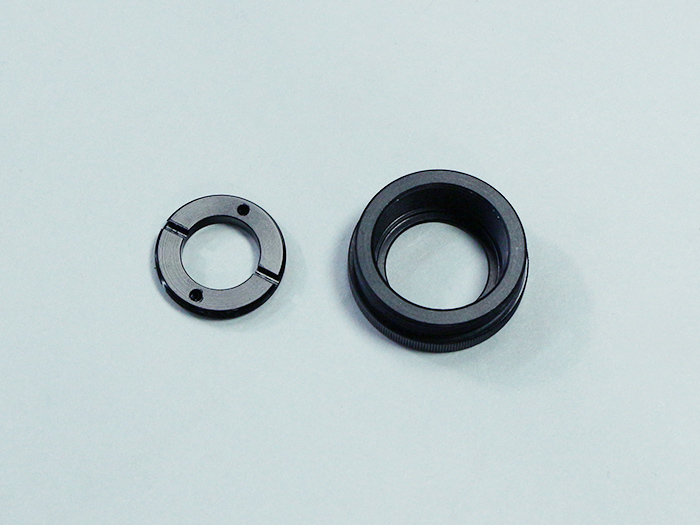 Attach the fixing ring on the mirror mount. Make sure that Reflecting Mirror is fixed well and held still. Make sure that the Reflecting Mirror is attached as it shown in the picture. Wipe out if there is any dirt or finger print on the mirror. There are 4 adjustment screws (2 spots and 2 screws for each) on the mirror mount. Adjust the inclination of the mirror. 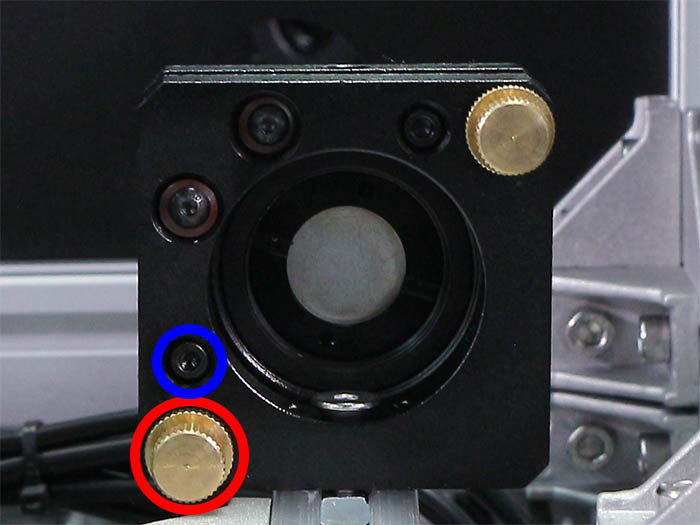 The screws locaterd in blue-circled part is used to shorten the distance between 2 plates, and the screws locaterd in red-circled part is used to broaden the distance. 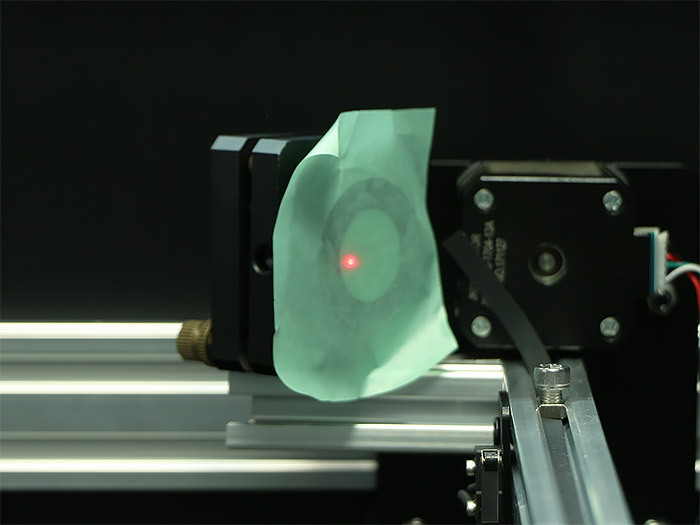 There are 2 patterns for usage; one is to "Loosen the blue part and Push out the red part" and the other is to "Tighten the red part and Push out the blue part", depending on the inclination of the laser beam. *The detail of the example how to adjust the mirror mount is explained in later part of this section. 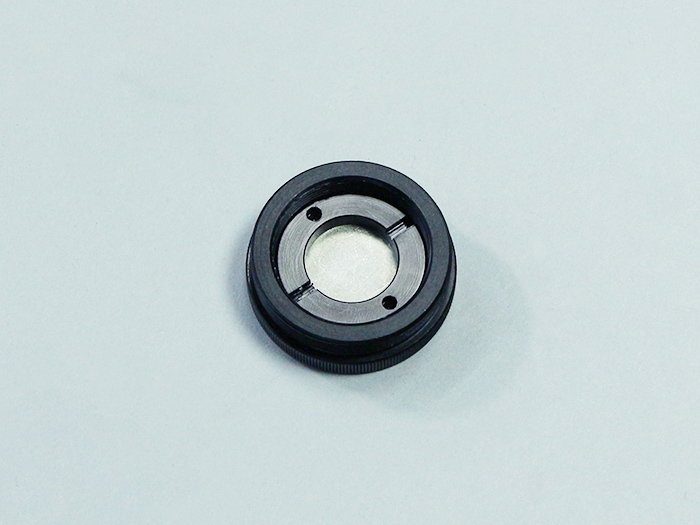 Seal the hole for laser optical path of inner cover and irradiate the laser. Adjust the iclination of the mirror mount if it is dislocated to either side. Slight change in inclination changes the location grealtly. 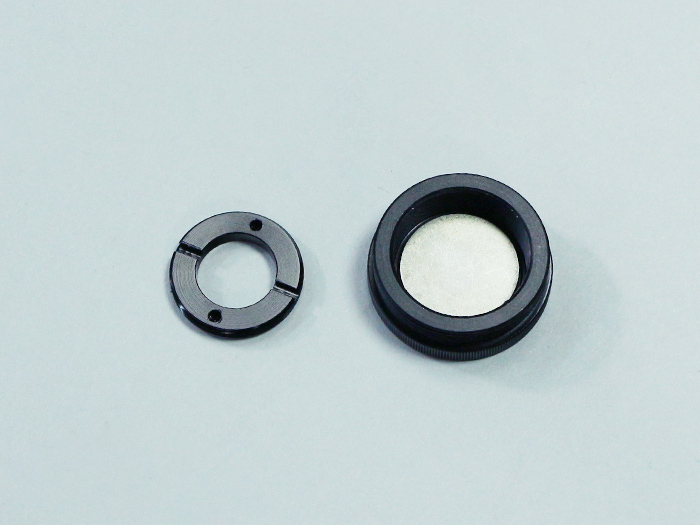 It is dangerous to move the mirror mount grealty, so do the adjustment slowly and gradually. 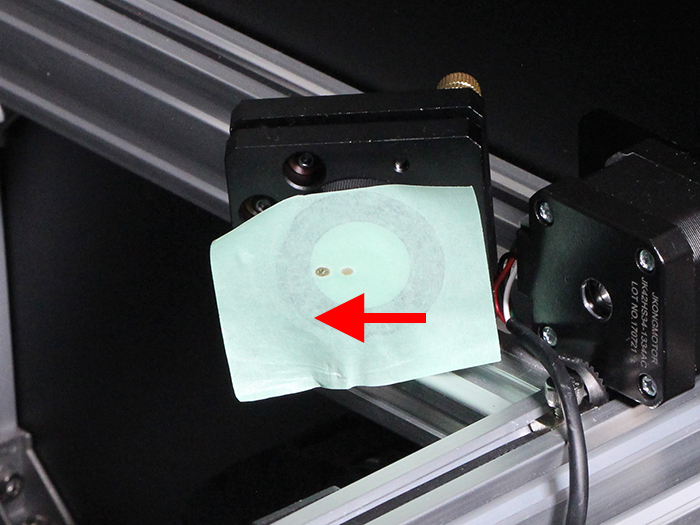 Move manually the x and y-axis to make the distance between No.1 and 2 mirror mount becomes minimum. *DO NOT irradiate the laser when moving the axis manually. 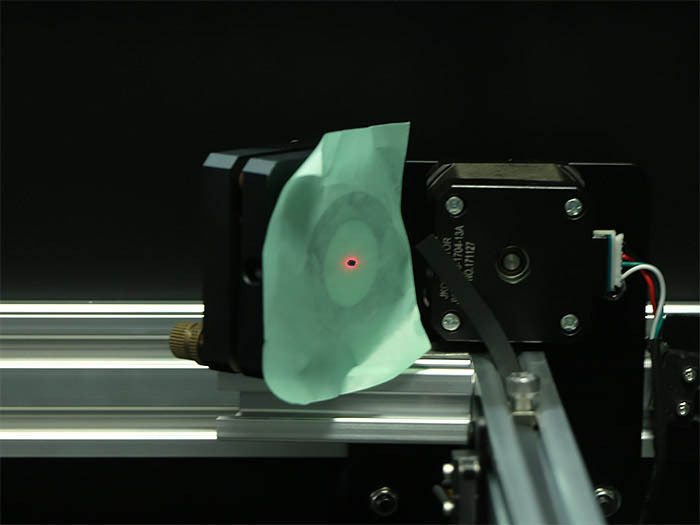 Try in the close distance since laser can be strayed greatly from the center because of the distance toward 2nd mirror. *Go back to the Inclination Adjustment procedure when the laser pointer is strayed greatly. 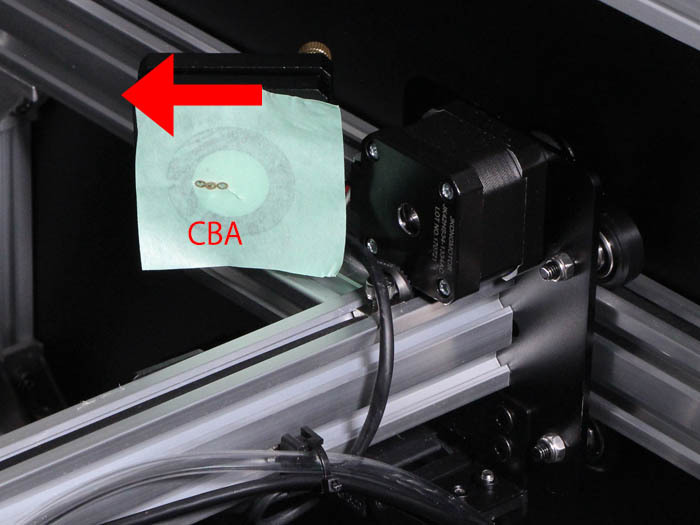 Irradiate the laser again on the center of processing area in the direction of y-axis. *Go back to the Inclination Adjustment procedure when the laser pointer is strayed greatly. Lastly, irradiate the laser again on the very end of processing area in the direction of y-axis. In the picture above, No. 1 mirror is slightly inclined to the left. 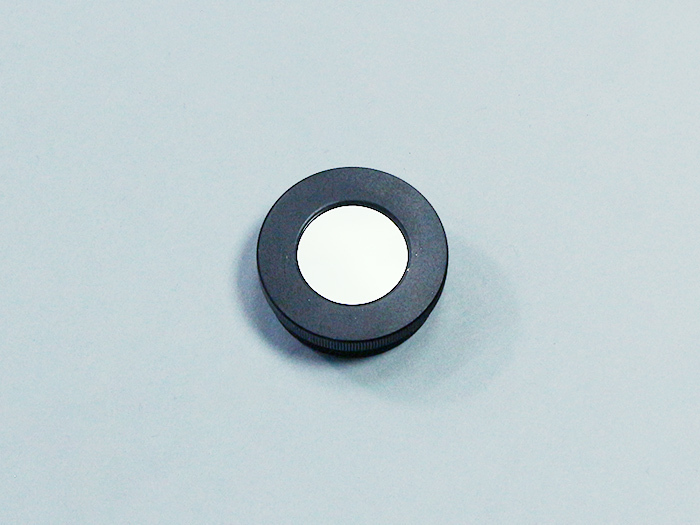 Correct the inclination of the mirror by using the adjustment screw of mirror mount. 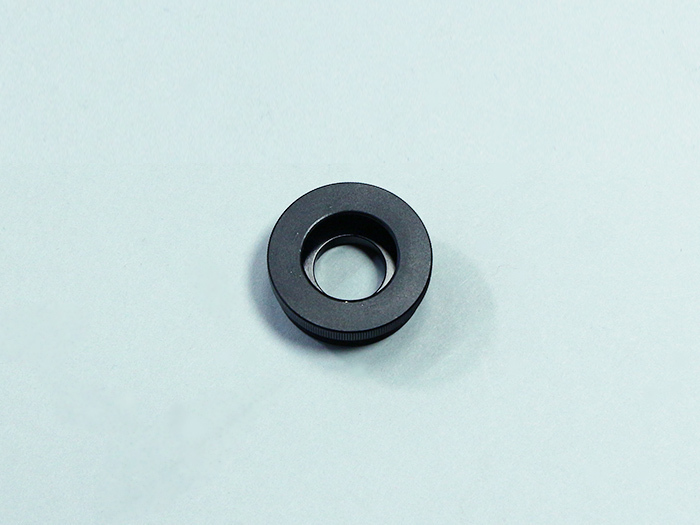 Standardize the position that the optical axis is aligned on the center. Loosen the blue-marked screw and push out the red-marked screw. The mirror mount is inclined to the left of the horizontal axis. If you pull it, it would be inclined toward the right. 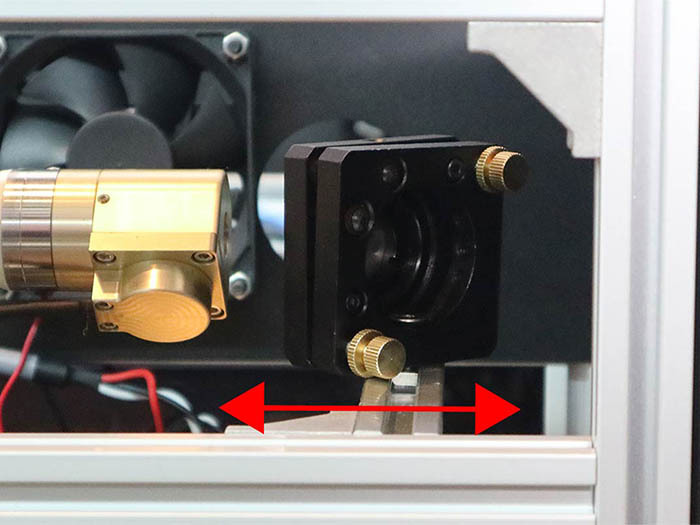 Move the other screw when you need to incline it toward the vertical axsis. It would be inclined toward the upper side when you push out the red-marked screw. It would be inclined toward the downr side when you pull the red-marked screw. 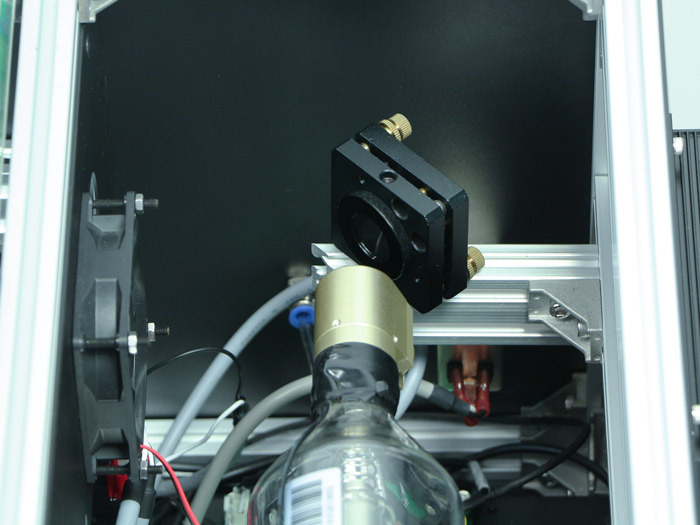 Adjust the mirror so as not to be deviated to side directions even if laser irradiate in various position of y-axis. 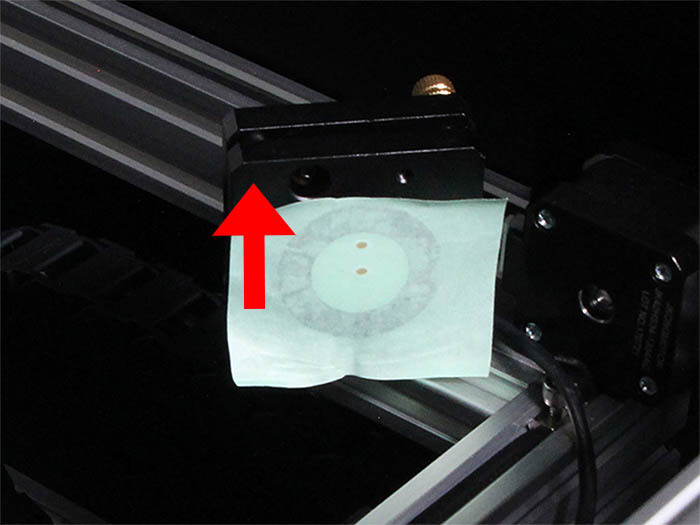 (Use the adjustment screw of mirror mount to fix the deviation in vertical direction.) In this picture, you need to adjust Optical axis C toward direction A since the optical axis is moving as it leaves from original point A. In that situation, move gradually and adjust No.1 mirror with the whole aluminum frame toward side direction. The alminum frame needs to be moved horizontally. 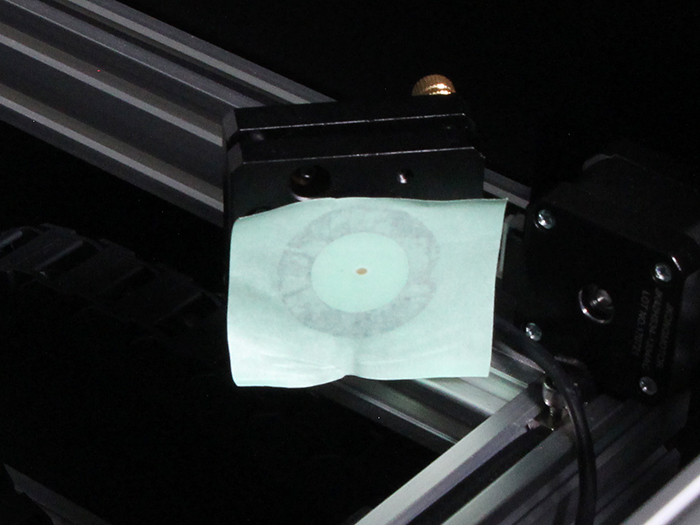 *Make sure not to incline the aliminum frame for No.1 mirror since it makes the optical axis deviated greatly. 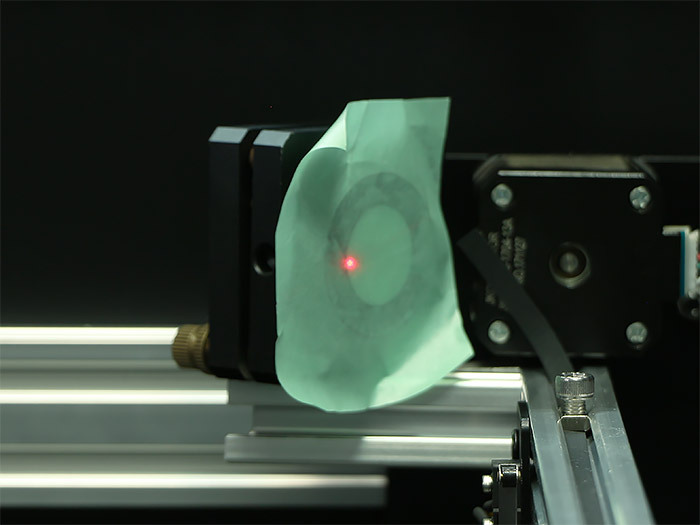 Irradiate the laser again on the front and back end of y-axis to make sure that the laser beam is pointing the center of the mirror.